Enter the appropriate information into the Run Control ID field. 1 Bus Unit: Reconciles all purchase orders within a single business unit. If you select this value, you can enter business unit and ChartField criteria. 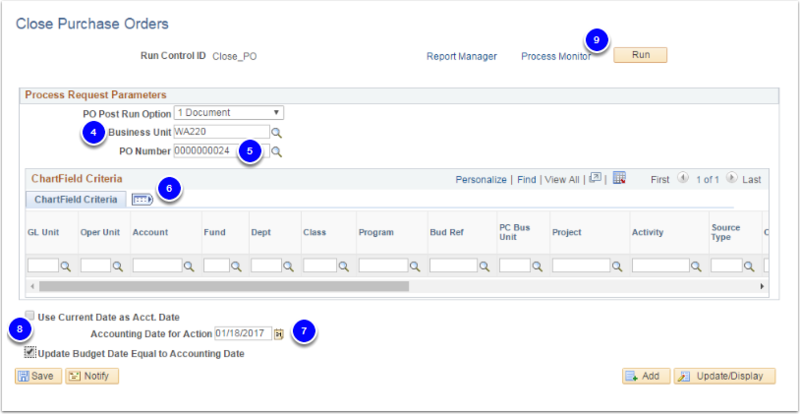 1 Document: Reconciles a single purchase order within a single business unit. 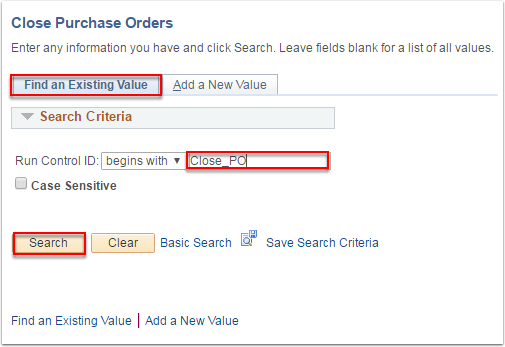 If you select this value, you can enter business unit, purchase order, and ChartField criteria. All BUs: Reconciles all purchase orders within all business units. If you select this value, all other fields on the page are unavailable for entry. Enter the appropriate information into the Business Unit field. Enter PO number in the PO Number field if PO Post Run Option field is "1 Document". Use the ChartField Criteria group box to select purchase orders for processing based on ChartField values. This option is useful if you are using commitment control and want to process purchase orders based on ChartField values. The Accounting Date for Action field displays the date that is used to determine the open period or allowable open date range for budget checking a purchase order when you are using commitment control. In addition, regardless of whether you are using commitment control, the system updates the accounting date with this date for the purchase orders that were closed by the reconciliation process. Select the Budget Date Equal to Accounting Date check box option. Click the Process PO_POREP check box option. 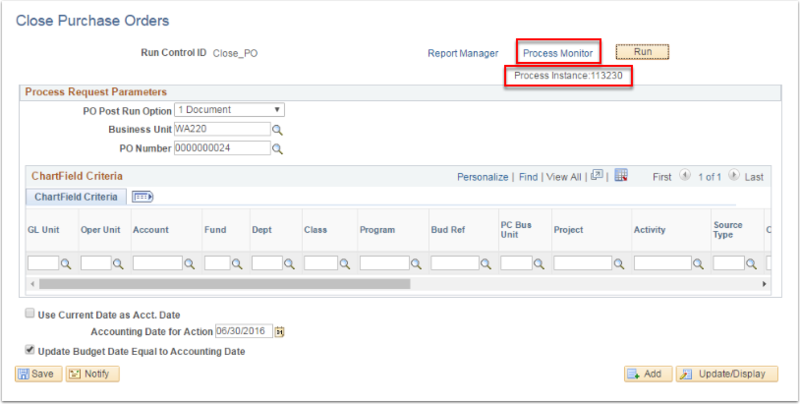 Notice that the Process Instance number appears. This number helps you identify the process that you have run when you check the status. The current status of the process is "Processing". The process is finished when the status is "Success". Continue to click the Refresh button until the status is "Success". Click the Refresh button. The Run Status is now Success. You have successfully run the PO Reconcile and Close process.